RS Components offers multiple solutions to help engineers exploit the benefits of a smart, connected factory approach. By leveraging the capabilities underpinning the Industrial Internet of Things (IIoT) and Industry 4.0 – two global megatrends that are revolutionising the industry – users are able to capture, collate, decipher and disburse vital, real-time manufacturing data, enabling them to make faster, better informed and immediately actionable business decisions. The key is giving products and machines the ability to communicate manufacturing and process data to the wider enterprise as efficiently as possible by a number of different means: Near Field Communication (NFC), Radio Frequency Identification (RFID), Modbus, Ethernet, etc. – all that is required is the means to collate and connect. A new landing page published on the RS website shows how users can easily create a connected architecture, even when working with commodity or ‘dumb’ products. The page details products and solutions that can read information from existing control systems, harmonise the communication protocols and make this information available to a wider network. In some cases, the solutions can even make the communication between machines or systems more secure. 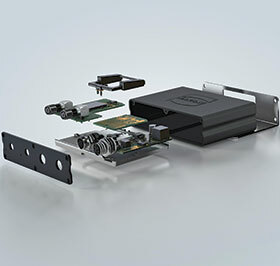 Among the many products RS offers are the MICA modular industrial computers from Harting, which offer open-source programming so users can develop integrated industry projects quickly, with minimal expense and disruption. These three solutions are just a small part of a myriad products and services that RS offers for wider connection capabilities.